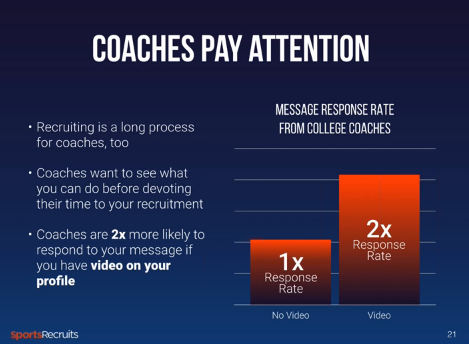 In “The Importance of Video,” Part 3 of our 4-part Webinar Series “Engineering the Recruiting Process,” Sports Recruits Co-Founder Matt Wheeler discussed how vital video is to a successful recruiting process. 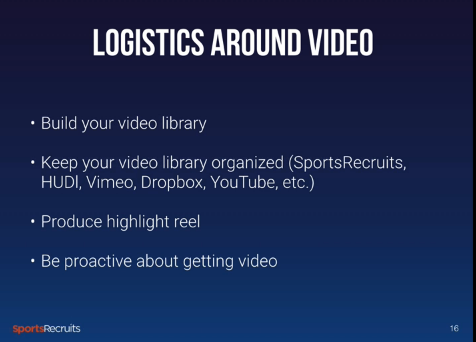 In the Webinar, he touches upon how video has grown to become a necessity in the process, how having highlight reels and full games drive engagement with college coaches and how a proper distribution plan is a key to the process that often goes overlooked. What It Means: Especially in the past five years, video has exploded onto the recruiting scene. While it was always important to have a highlight reel or game tape, often this was a labor-intensive process that took a backseat to live action. However, thanks to advances in technology, the proliferation of recruiting events and film-focused companies, video is now more accessible and malleable as ever. The proof is in the numbers: In the past year on our platform, college coaches have watched over 240,000 hours – over 1,000,000 minutes – of streaming video. That is 2.52 years in 12 months. While this is certainly eye-popping (sorry to use that phrase, Game of Thrones fans), it should be seen as an opportunity: You can be seen by a college coach anytime, anywhere year-round. While attending recruiting events is certainly important, it’s also notable that you can be seen on a random October Tuesday as well. As such, it is important to be cognizant in building a library of video to use for your highlight reel. Ensure prior to events or high school games you are asking coaches if there will be video, or if you need to be responsible on your own. Nothing is worse than looking for video after-the-fact, so keep that in mind! Having video all leads to building that 3-5 minute highlight video, one that showcases your best attributes as a player. Remember, college coaches are looking for athletes – not just skills. So be sure to show things that highlight your versatility. The average viewing time for a highlight reel on our platform is 3:18 – which amounts to about 15-20 clips. What It Means: Having video is the vital first step to creating a highlight reel, which serves as your athletic resume to a college coach. -Families tweet out their highlight reel or host it on Youtube, Vimeo or any number of hosting sites. -While those are fine, they may not see a return, because they are just being tossed into the ether. -Maybe this reel is sent via email to a college coach. While this is a great step, you don’t know if coaches are looking, or if they are interested. It’s akin to throwing a pebble in the ocean. -While this scenario is specific to our platform, it should at least inform you on how important it is to target the right schools and have a plan. -You research schools and have a solid target list. -Send that school your information via your profile and all of the data is tracked. You know who is looking and when, and it allows you to make an informed decision going forward. What It Means: Having video is the important foundation, and having a distribution plan to get it to college coaches is the engine that makes the process move. But is it worth it? The numbers point to a resounding yes. We took members in the Class of 2015 on our profile, and put them into two groups: Those with video and those without. Everything else about their makeup – sending messages, complete profiles – was the same. 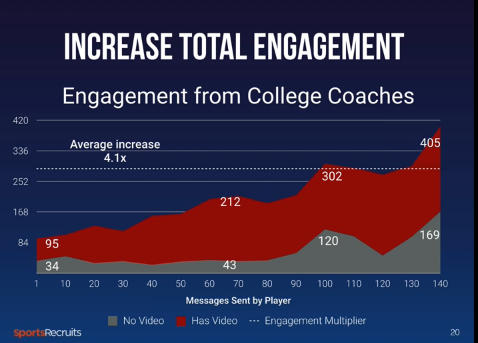 Here is what we found: Having video resulted in 4.1X the exposure with college coaches. Breaking this number down, it makes sense: Providing a coach with a highlight reel gives them something to get to know you as an athlete. You are not telling them about you; you are showing them.